I was perusing the soup isle at the grocery store the other day because I needed a can of cream of chicken soup. When my eyes landed on the Bean and Bacon soup I just couldn’t get it out of my mind. 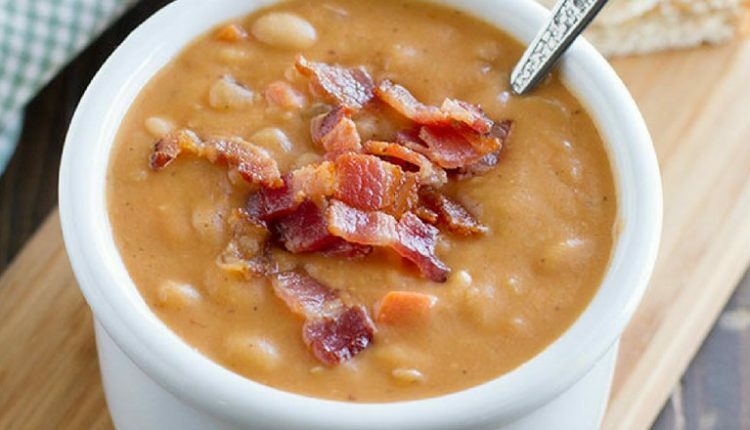 I loved eating Bean and Bacon soup when I was a kid, it was so creamy and satisfying. I almost picked up a can but when I saw how much it cost for what was sure to be one meal I hesitated. I knew I could make a whole pot of soup for my family and have enough for leftovers if I made it myself, and even though I grew up on the taste of the Campbell’s version I know that anything made fresh tastes so much better and is better for you. I love that this uses canned northern beans, but for you die hard Insta-Pot chefs, go ahead and start with dry beans and cook them up first. Talk about stretching your food budget dollars. This is what Deborah of Taste and Tell has to say about this childhood favorite. Quick Tip: This is seriously so good you might want to go ahead and make a double batch in your crock pot or Insta-Pot and freeze some for later. Recipe and image courtesy of Deborah of Taste and Tell.